It’s Friday night which means…pizza! Funny I say that since we’ve only had pizza on a Friday maybe 3 times since the beginning of the year. It use to be almost weekly but with our Family Foodie Date theme for the year being pizza we’ve gone out for pizza on Thursday nights or other nights. Pair that with the fact that we’ve been out of town many Friday nights this year the ones we have been home we haven’t been doing our homemade pizza nights. Instead going for something quick and easy like take-out sushi. To say things haven’t been normal or routine this year would be an understandment, especially the last month. Friday night, or any night, pizza is one of our family favorites. We decided to start playing with sourdough pizza instead of our go to “famous, among friends and family” homemade Neapolitan pizza crust. 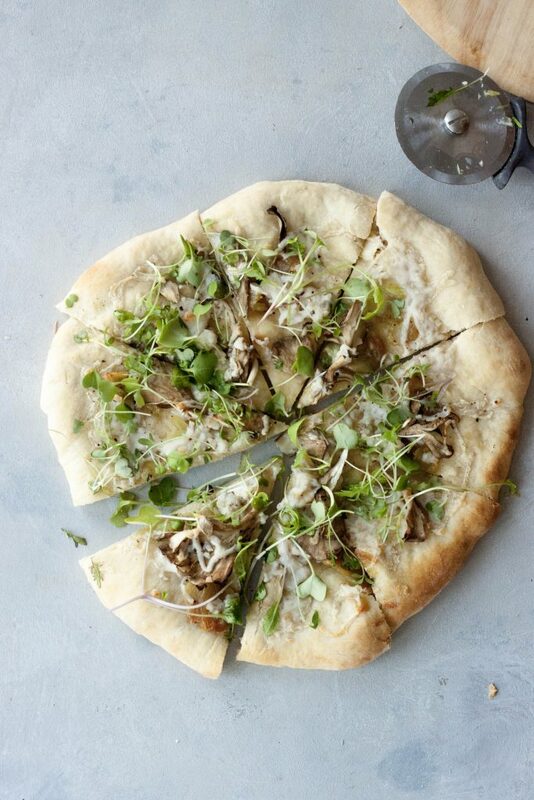 If you love flavorful lighter pizzas and garlic you will love this Roasted Garlic Mushroom Sourdough Pizza! I’ve been in a lighter, not so heavy on the toppings, fresh pizza mood. Like the Asparagus Neapolitan Pizza I posted a few weeks ago and now this Roasted Garlic Mushroom Sourdough Pizza. One of my all time favorite pizzas is a margarita pizza but it’s not cooked. Basically a baked pizza crust and then tomatoes, fresh mozzarella, and basil added after. 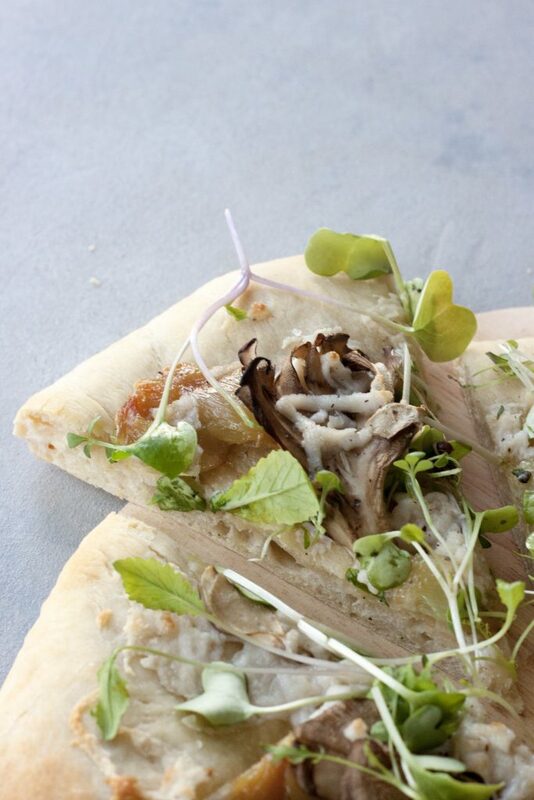 Fresh, light, and really all I want is the chewy salty crust to dip in extra virgin olive oil and balsamic vinegar. Don’t get me wrong I like pizza but there are many times I don’t want heavier traditional pizza. There are times I really want to pack on the fun flavors and trust me those are coming! I have a couple I cannot wait to share. One will come in a few weeks and trust me it will be worth the wait. Since my gluten sensitive tummy is still handing sourdough so well, yes since Christmas we’ve been baking multiple loaves of sourdough bread each week and bread has become a regular in my diet for the first time in over 10 years! Crazy I know and it’s been life changing and so many days I just crave a simple piece of toast. While I found some sprouted breads that my tummy handled well in the past years they didn’t handle it this well. So as I’ve posted on social media my husband has also been making fresh pasta and I’ve been ok with that but of course it’s not large amounts. Still progress is progress and I’m not going to fight it. So since pizza is one of the things I still love and enjoy that my tummy doesn’t handle very well we decided to play with sourdough crust. It’s good, really good, but I will say it doesn’t compare to our puffy chewy homemade Neapolitan Pizza Crust. That said enjoying it and not dealing with tummy bloat is nice so I think we will be playing with this more in the future. As I said if you like garlic you will love this pizza! Roasted garlic is so different then raw garlic so if you read the ingredients and are thinking a whole head of garlic don’t panic! Raw crunchy garlic cloves are transformed into buttery soft caramelized milder garlic flavor cloves when roasted. It isn’t hard either just cut the top off a head of garlic, place on a piece of foil, drizzle extra virgin olive oil over the top of the cut head of garlic, wrap in garlic in the foil, and bake at 350F for 45-60 minutes. If you haven’t had roasted garlic you need to try this because you will be pleasantly surprised. Pair the roasted garlic with mushrooms and cheese and it’s simple delicious. 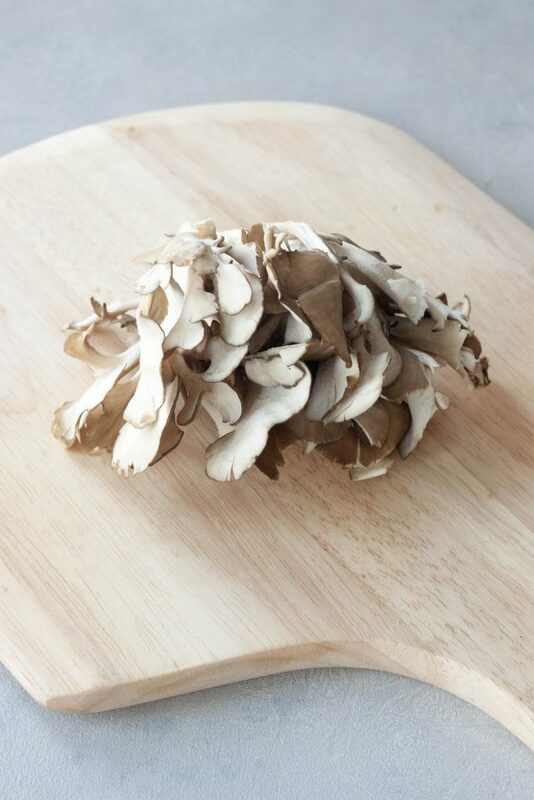 I was going to get shitake mushrooms but stumbled across this orgniac Maitake Frondosa Mushroom and thought it was fun and it turned out perfect. There isn’t a lot of cheese on this pizza but enough to give it what it needs and not be heavy. While it wasn’t the prettiest and I wanted something that screamed spring I added micro greens. Ok maybe in the back of my head I was thinking if I can add enough micro greens maybe I could call this half salad and half pizza, haha. Kidding of course. This pizza has me ready for summer, yep forget spring. Not really because we tore out our garden last fall and had our lower walkout patio re poured so we have a lot of work ahead before summer. Repairing lawn that was torn up, some projects with the patio, and starting the garden over from scratch. I loved our garden and the white picket fence but it was getting old and needed to be redone and the easiest and best way to do it was tear the whole thing out and start new. We left a few things like raspberry bushes but that’s it. So as fun as I thought it would be I can’t seem to figure out what to do and a design I like. I’m sure we’ll figure out, we always do. We also have a new patio set coming with a fire table and I can just imagine sitting on the patio with this pizza and a glass of white wine listening to the ducks in the pond and the girls giggling while unwinding after the week. Some people have their classic go to pizza that never change, others like to switch it up all the time, then there are those in between and just go with their mood and the seasons. What’s your pizza eating style? *We used our sourdough starter and followed Culture’s For Health Sourdough Recipe. We doubled the batch and made it into 3 crusts. We usually use our Homemade Neapolitan Pizza Crust recipe but since we’ve been loving sourdough wanted to start playing with it as an option. If making sourdough crust you will need to make sure you feed your starter 3 times 4-12 hours before you want to make your crust. Your crust once made will only need to rest for 30 minutes. If making our Neapolitan Pizza Crust if using, you will have to make the dough 3 hours, 4 hours is best, ahead of time. It doesn’t take long to make you just have to let it rest and rise. Heat grill or oven, with pizza stone placed inside, to 550F if using my husband’s crust recipe otherwise heat per your pizza crust directions. Toss or roll your pizza dough and place on a piece of parchment paper on a non rimmed baking sheet. If you are making the sourdough you will need to brush it will olive oil and bake 7 minutes prior to adding toppings. Brush pizza crust with oil using just as much as needed. Smash individual garlic cloves, with the skins removed, between your fingers and place on the pizza. We like garlic so used a whole clove (remember roasted garlic is much sweeter and not as strong as raw garlic). Sprinkle with a little sea salt. Top pizza with mushrooms and shredded cheese. Place pizza, keeping it on the parchment as it will easily slide on and off your pizza stone, onto the pizza stone. Check at 6 minutes, the crust should start to be golden brown and slightly blackened on the outer edges like a traditional Neapolitan pizza. 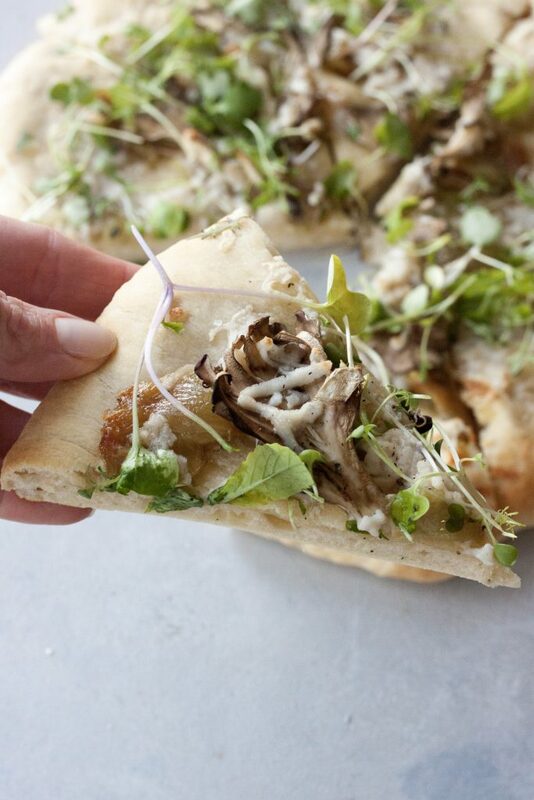 If making with sourdough crust you want to bake for about 7 minutes until the cheese has melted. It can take up to 8-10 minutes depending on the temperature of your grill/oven. If using your own crust bake per your crusts instructions. Remove pizza, sliding a baking sheet under the parchment paper. Top with micro greens just before serving. Enjoy! 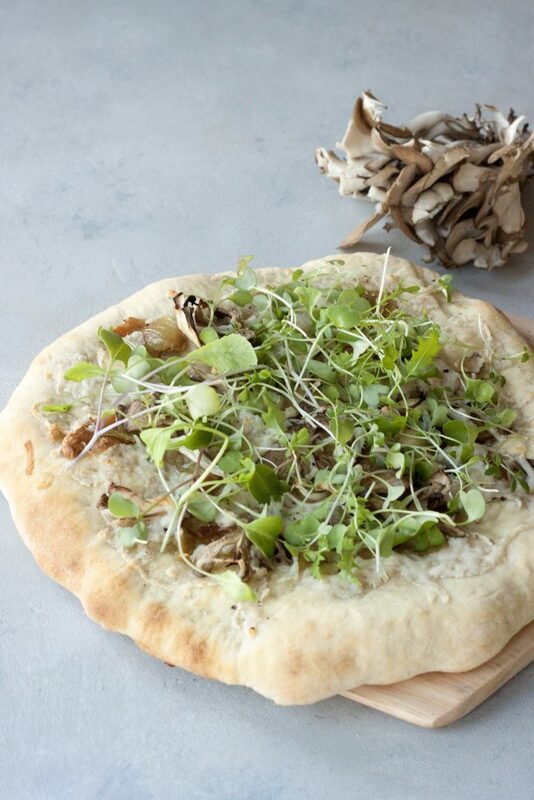 Roasted Garlic Mushroom Sourdough Pizza is a delicious vegan, gluten free friendly, pizza that’s full of fresh flavor. Perfect for a spring or summer night. It’s so good! Hope you had a great weekend! I am so intrigued to try this recipe! I am also gluten sensitive and have always stuck with either gluten free pizza or regular pizza and suffered the consequences (it’s too good!). But this looks great and totally worth a try! I know the feeling since I deal with the consequences too often. Sourdough has been so good on my tummy it’s crazy. 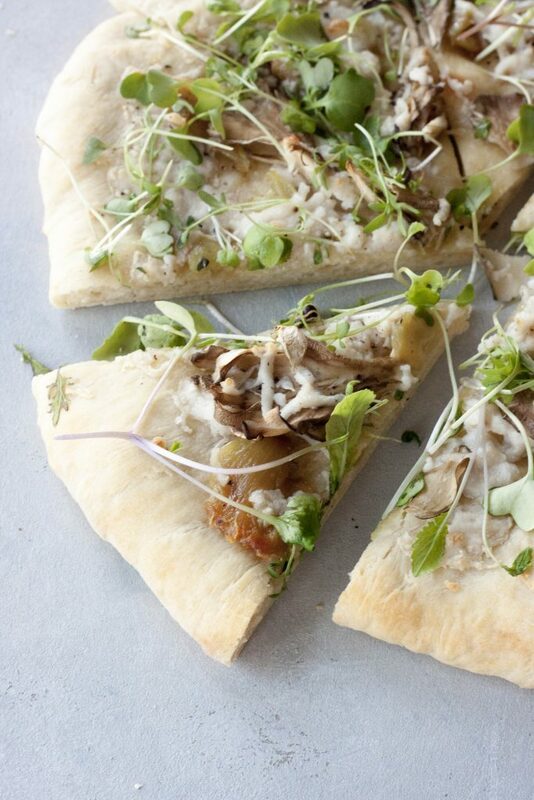 Sourdough is such a great pizza crust idea! Love that look of that mushroom too! Thanks Jessica. It was such a fun mushroom I had to. This looks so simple and delicious! Loving that mushroom! Isn’t it a fun looking mushroom? Thank you, it’s a simple and light pizza and just screams spring to me. You had me at pizza! This looks amazing! I’m loving the sourdough crust! Thank you, I know that feeling! You have my mouth watering! Garlic and mushrooms oh my!!! I may have to make this and soon! I hope you do! Keep me posted.